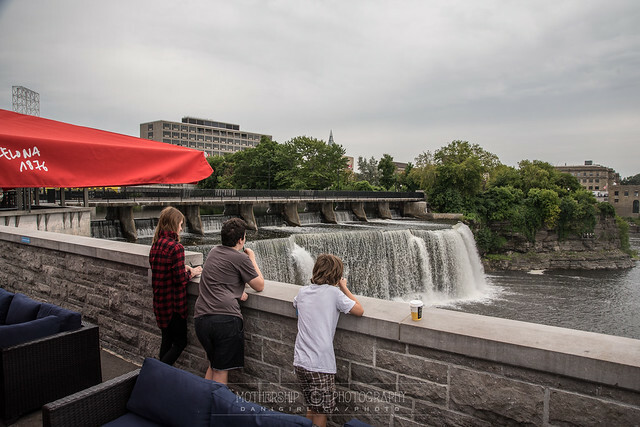 If you’re looking for a wonderful little spot to bring the family for lunch and a lovely view of the intersection of Ottawa’s two rivers, we had a really lovely lunch one summer afternoon at Ottawa’s new Tavern on the Falls. It might have been because it was a Monday, or because the sky was threatening rain, or because it was mid afternoon, but we had the place pretty much to ourselves. It’s a cousin to Tavern on the Hill, in Majors Hill Park. It’s a little tricky to find the first time. 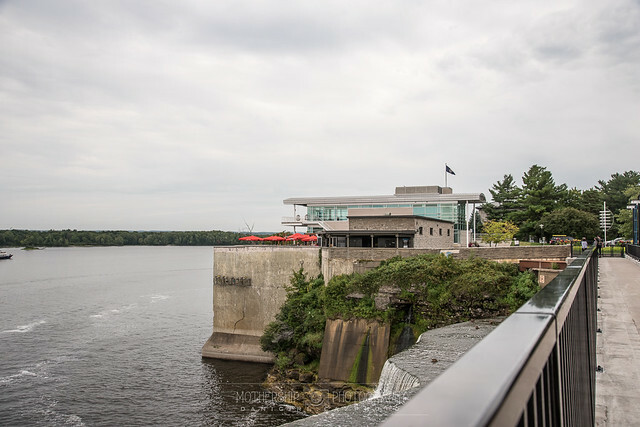 It’s tucked behind the Royal Geographic Society building on Sussex Dr, right in between it and the falls where the Rideau river meets the Ottawa river. 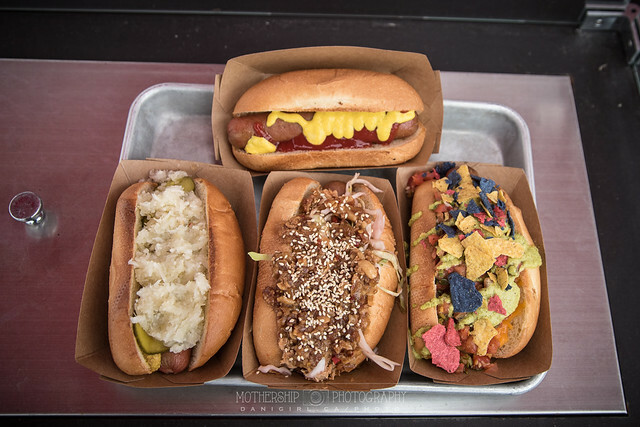 The menu is simple, with gourmet hot dogs and an assortment of pre-made salads and wraps. 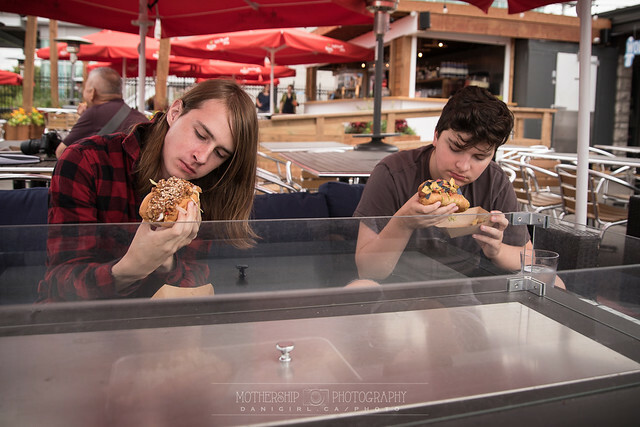 We were impressed with the options for the hot dogs. There’s also what looks like a full service bar, but we weren’t there for drinks. We did, however, imbibe in some ice cream after our hot dogs. It was spitting a bit as we finished lunch, but the umbrellas provided enough cover to keep us dry. In fact, it was a little hard to tell the difference between the sprinkles and the spray from the falls. 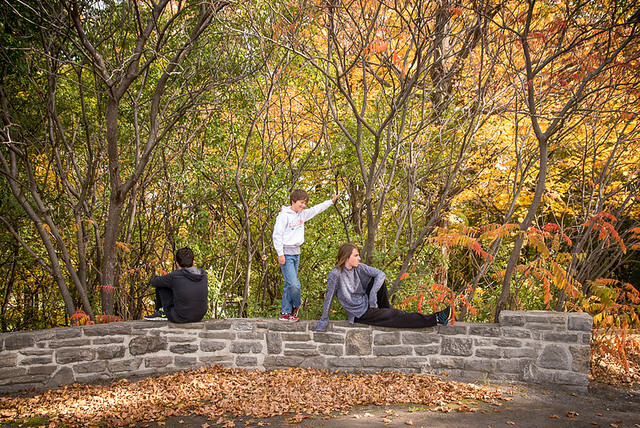 It’s a lovely area to wander, not too far from Rideau Hall. 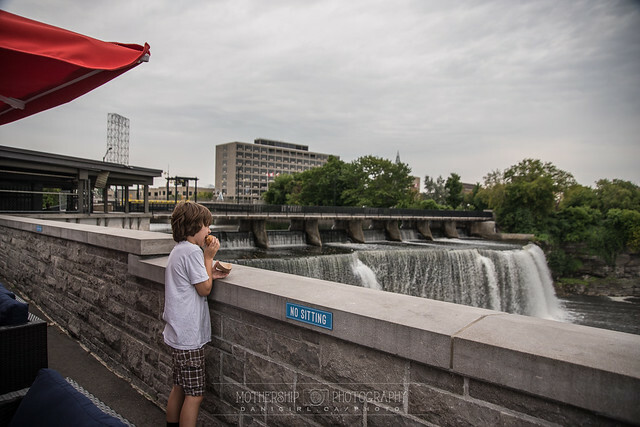 We didn’t make it that far, but we did poke around the falls a little bit, talking about how they’re the reason the Rideau Canal was built, and how Ottawa came to be settled because of them. Here’s the view of the restaurant from the other side of the falls. 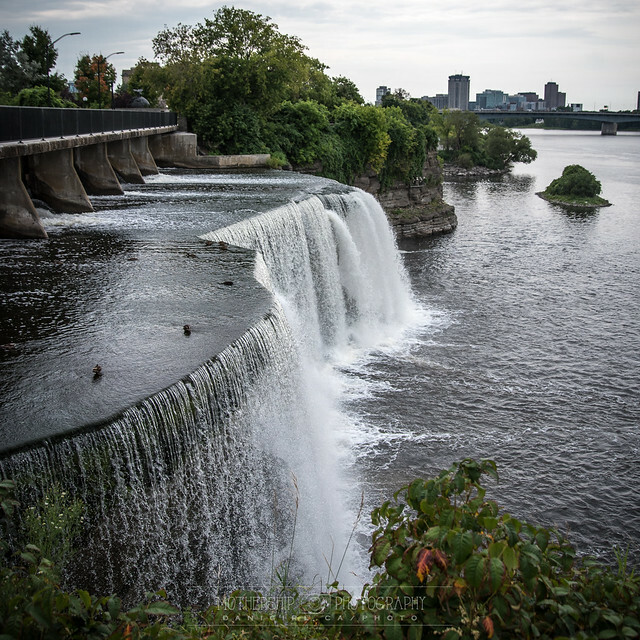 You can really see in this photo why they called these falls “Rideau” – which means curtain. We spent a lovely, lazy hour or so having hot dogs and ice cream and poking around the falls. I can imagine the sunset views are stunning, and plan to come back when the fall foliage turns colourful – won’t be long now! All in all, a lovely if not inexpensive lunch out with a gorgeous view, even on a rainy afternoon, and highly recommended. Tavern on the Falls is open from early morning (with Bridgehead coffee and Maverick’s doughnuts!) to late night, through the end of October, weather permitting. The street address is 1 John Street, but we found it by looking for the Royal Geographic Society and wandering around behind it. 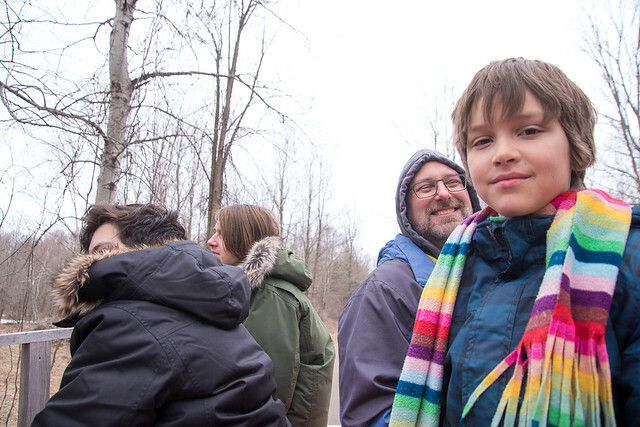 Every year on or around the first weekend in April, the Ontario Maple Syrup Producers host an open house. 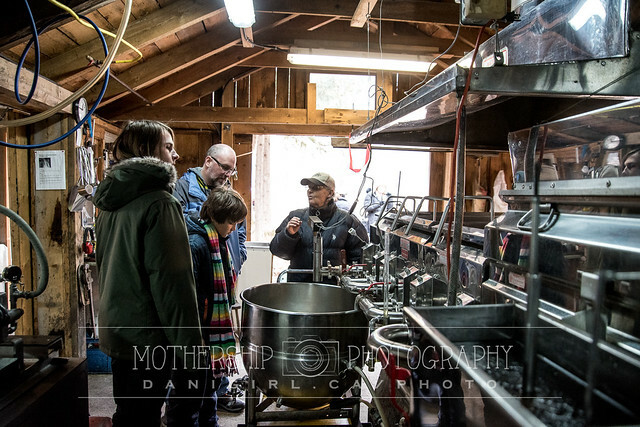 I don’t remember how exactly we heard about Oliver’s Mapleworks in particular, but they met my planning criteria of a fun family day out that would likely be a little less crowded than some of the larger local maple producers like Wheelers and Fulton’s, and within an easy hour’s drive. We had THE BEST time! It was a decent day for a ramble in the countryside, not quite spring warm (so not muddy) but not as windy or unpleasant as it has been the past few weeks. (Sidebar: has anyone seen spring? Please release it to the wild so we can all enjoy it!) We were immediately greeted by a friendly woman who engaged us right away, taking us on a tour of the maple condenser and extractor, and the reverse osmosis unit they use to further concentrate and purify the sap. I think she said they had a couple thousand trees tapped in a sugar bush that has been producing maple syrup since the early 1800s. (You’ll forgive me for any errors in fact or egregious speculation. I wasn’t taking notes!) Most Canadians can tell you that sap becomes syrup by boiling it until most of the water evaporates, but I thought it was pretty cool that they can use a condenser to remove up to 2/3 of the water before the boiling process even begins. 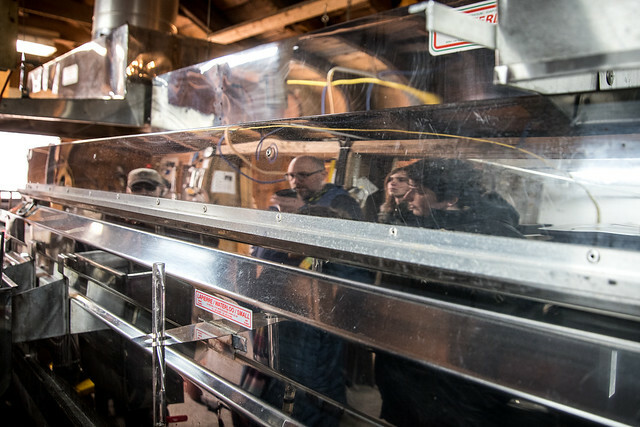 The tour itself was fascinating – turns I don’t know half as much about maple syrup production as I thought I did. 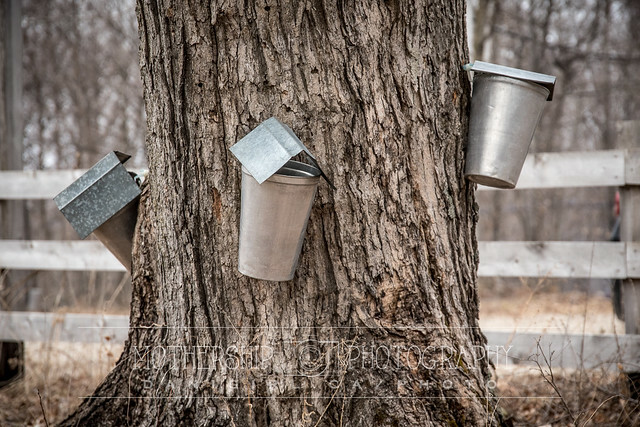 And it seems like being a maple farmer is a LOT of work – she said on days when the sap is running, they get started around 10 am (when it warms up enough for the sap to start flowing) and often don’t finish until after midnight or later. Oliver’s is definitely a family operation, and our visit felt warm and friendly like a family-run business, too. After our tour, we sampled maple syrup, maple butter and my favourite, maple sugar. Did you know that they’re all basically the same thing, just with increasing amounts of water removed? And further, we learned that all maple syrup has a sugar content of 67%. The variations in colour from light to dark come from the sap itself and can change based on the time in the season when it’s drawn. After raising our own blood sugar levels to what felt like 67%, and after a delicious lunch of maple sausages with maple mustard on a bun and, I kid you not, maple coffee, we had a fun wagon ride with the owner and proprietor of the farm, Dave Oliver, who further educated and entertained us. But what’s a farm visit without animals? 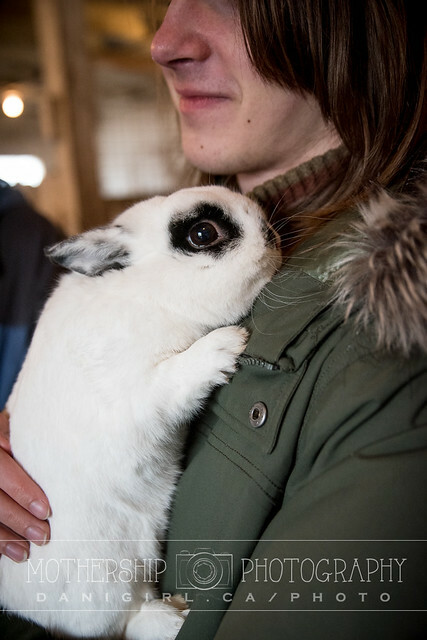 There were miniature ponies, goats, and bunnies to greet. 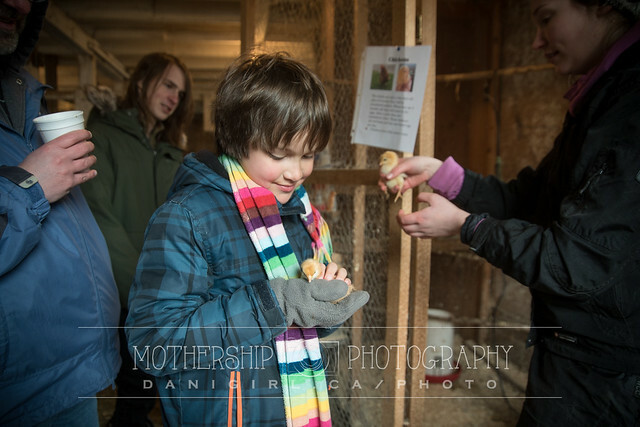 Oh, and did I mention the free range chickens and five day old peeping chicks? This was seriously one of my favourite family outings this year. The Olivers and their employees and helpers were charming and welcoming, and answered my endless questions patiently. (Yes, I am still that curious nine year old with my hand in the air. Some things never change.) 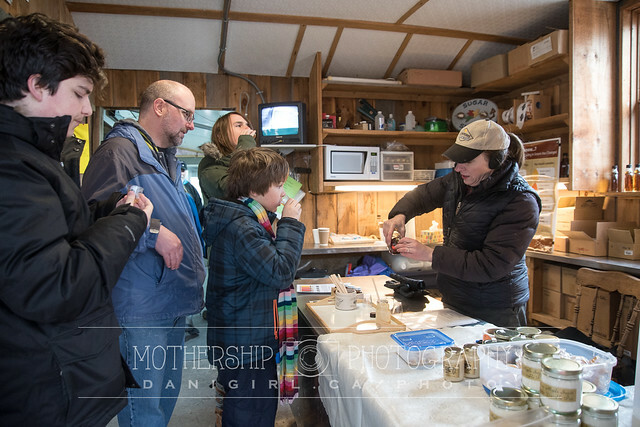 There are more than a dozen maple producers open to the public in Lanark County alone, but I’d have a hard time imagining any of them putting on a better family day out than Oliver’s Maple Works. It looks from their website that they’re open for visits but “please contact us by phone or email if you are planning to visit us so that we can make arrangements to greet you.” It’s a drive we’ll definitely make again! Hi! Remember me? I used to post stuff on this blog. I’m back! 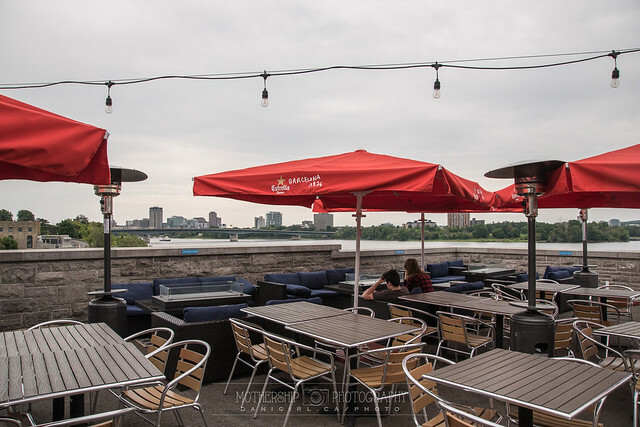 If nothing else, sharing photos of my favourite Ottawa places keeps drawing me back to the blog. You know how much I love the Manotick Mill, right? 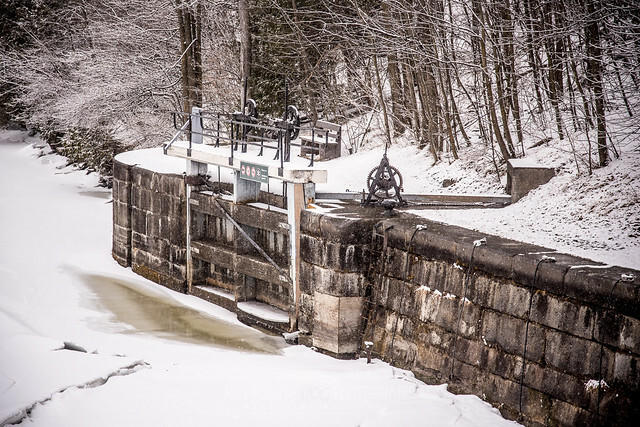 But I almost forget sometimes that Manotick has another gem of a location hiding in plain sight, the Long Island Locks. I spent a blissful couple of hours poking around this morning in peaceful solitude of a late-winter snow flurry. There’s a lot of history in this shot. 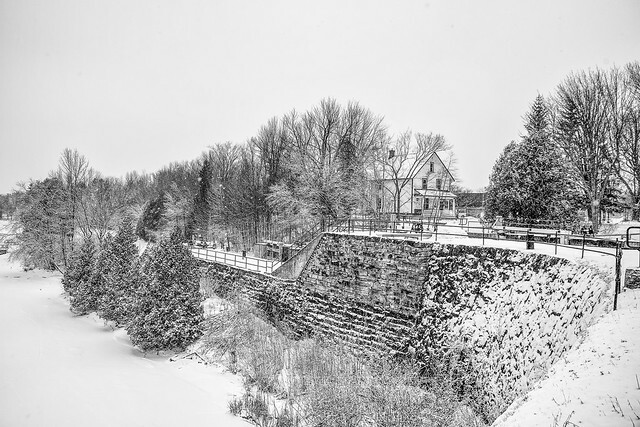 The house you see is the lockmaster’s house, built in 1915 and currently occupied by Parks Canada. The arch dam you see sweeping toward you in the lower right corner is the stone arch dam, built and virtually unchanged since 1830, during the construction of the Rideau Canal. 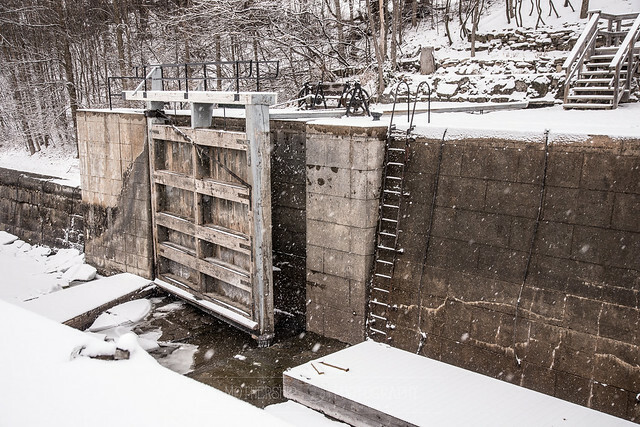 The locks themselves were also built around that time, under the supervision of Colonel By. 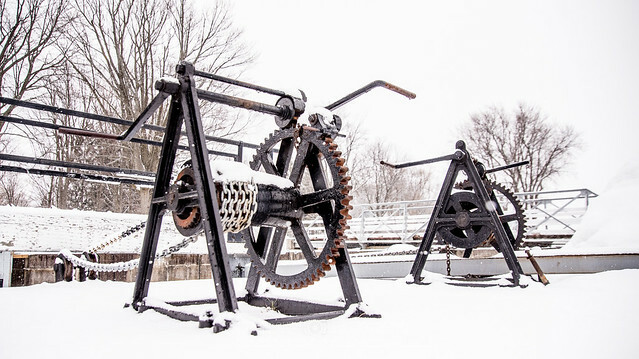 At one time, a small village called Long Island Village flourished here, but it disappeared in the late 1860s and 1870s when Moss Kent Dickinson built his grist mill up river and began buying up lots on the west channel of the Rideau, establishing the village of Manotick. Andrew King wrote a great blog post last year about the lost village of Long Island. It’s a long way down. I like how this one is sort of abstract. 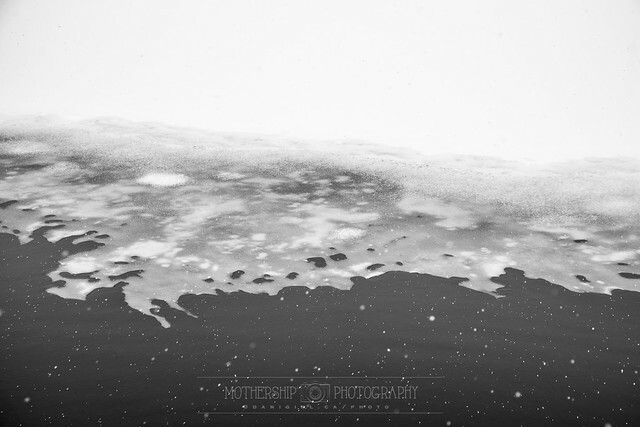 It could be a macro shot a couple inches across, or it could be the ice shelf off Greenland. I like how the snowflakes sort of hint at stars, giving it an otherworldly vibe. So while I don’t love snow in March, and I am pretty much done with winter, it is still lovely to know that a little fresh snow can turn something familiar into something quite beautiful. And I didn’t even get a good photo of the 115 year old swing bridge, or the weir that attaches Nicholl’s Island to Long Island. 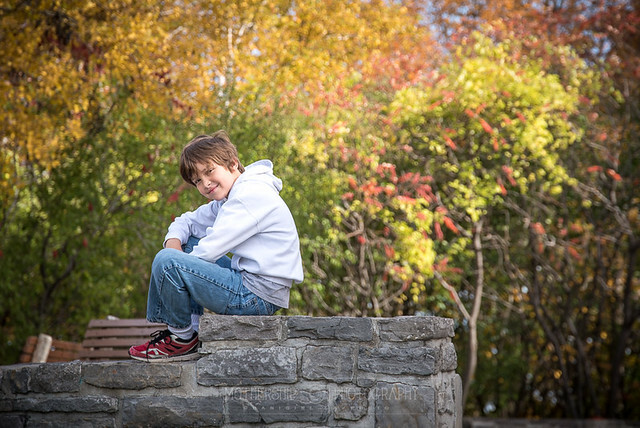 It also reminded me what an awesome location this would be for family portraits. The snow won’t last forever – I’m sure I’m not the only one thinking ahead. 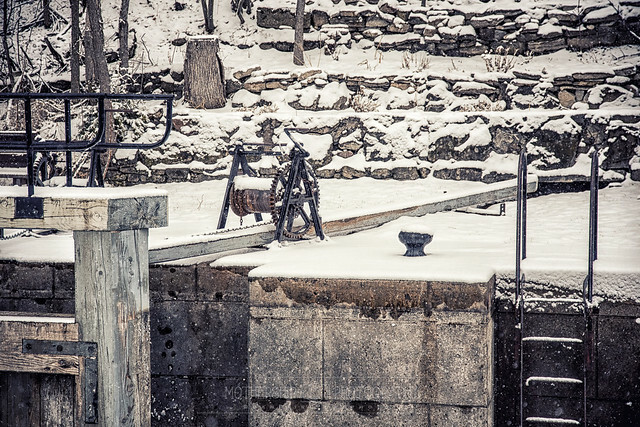 Who wants to do outdoor portraits at the Locks this year? You know where to find me! I think the paths along Hogsback Falls in Ottawa are truly one of the city’s overlooked treasures. I see photographers crawling all over the Arboretum but am surprised that I rarely see family photos being taken at Hogsback – there’s a stunning variety of backdrops and perfect places for posing and playing. It’s been a few too many years since we’ve been there, though I drive past it on my commute every single day and think about stopping. 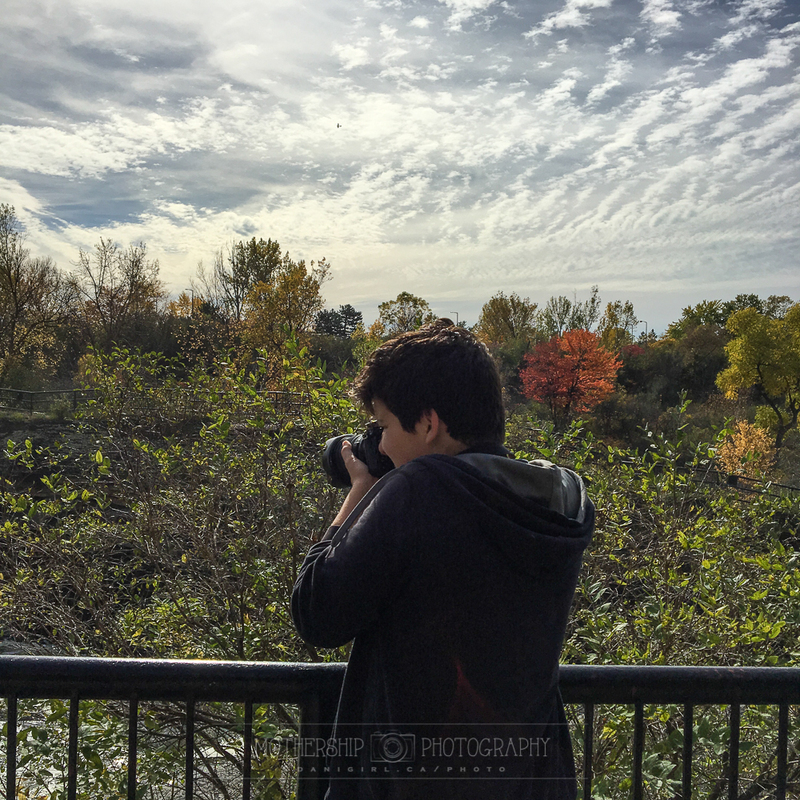 We took advantage of the incredible weekend weather to go out for a wander. 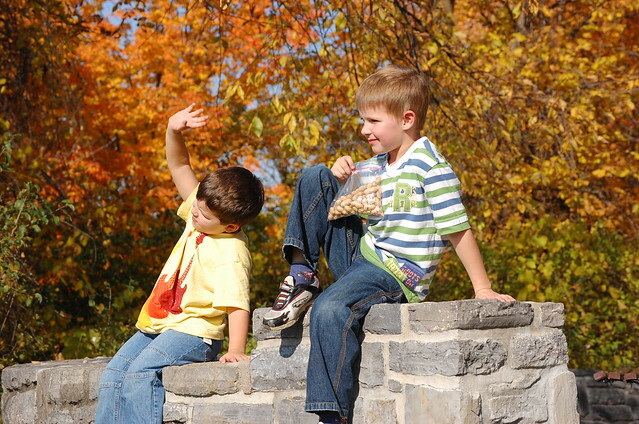 Taking photos of the boys is more of an adventure than it used to be. 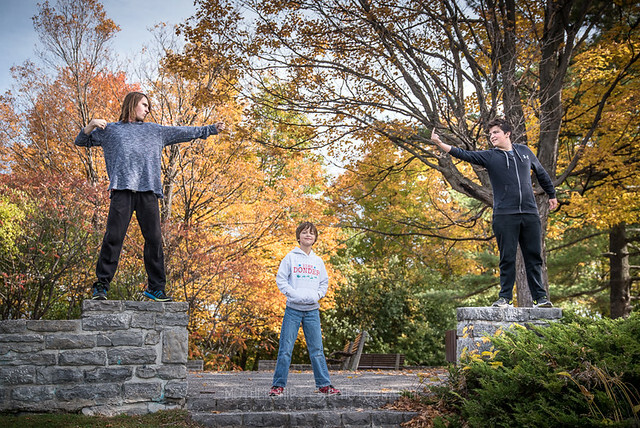 I told them to “go over there so I can take your picture.” The posing and art direction was left up to them. I think this would be an acceptable alternate cover. Some of them are more willing to pose for me than others. It depends on the day which kid is in which category! Did I mention it’s been a FEW years since we were up on the lookout? We have a few favourite spots we go to year after year. I’m making sure that Hogsback Falls is put back into rotation from now on! 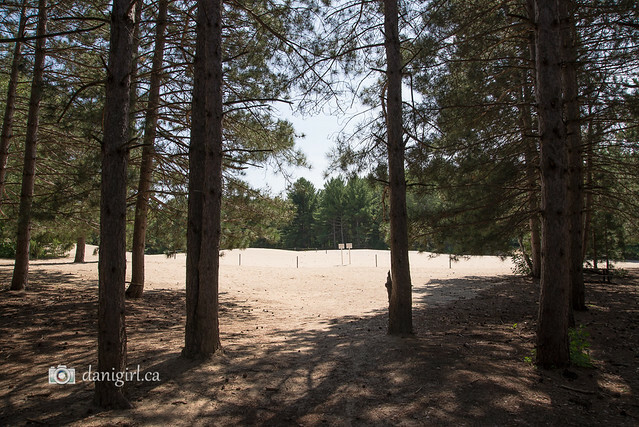 Did you know that there’s a 10,000 year old sand dune hiding in a pine forest in suburban Ottawa? 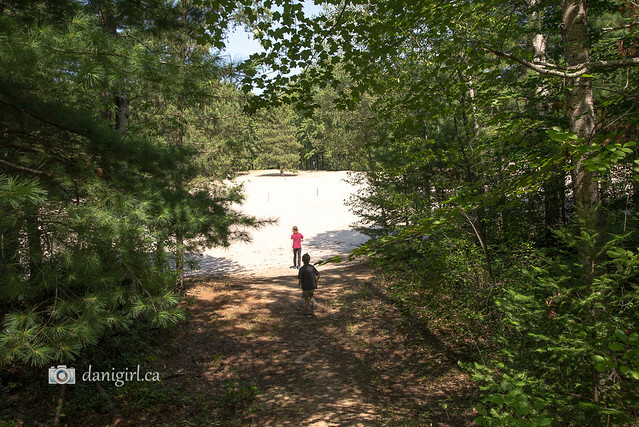 The sand dune in the Pinhey Forest is an ancient remnant of the last ice age, when what we now know as Ottawa was submerged under the great Champlain Sea. 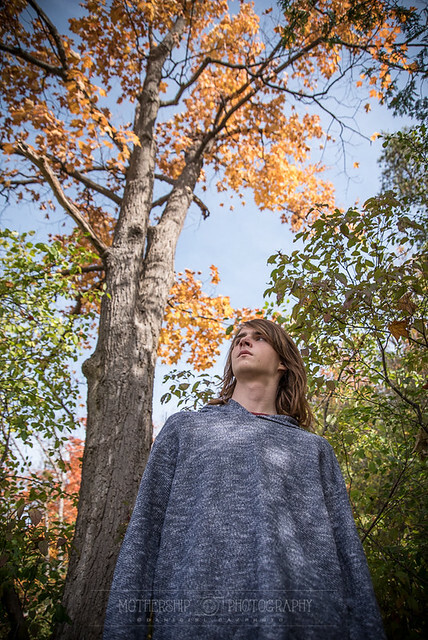 Even 100 years ago, the dune system was up to 10 times larger than it is today, stretching from Woodroffe across Slack to Merivale Road, but suburban homes, businesses and well-intentioned tree planting by the National Capital Commission in the 1950s have reduced it to a fraction of its former size. This graphic from the Biodiversity Conservancy shows the dune size as shown in 1925 aerial images outlined against the current dune inside the yellow dotted line. 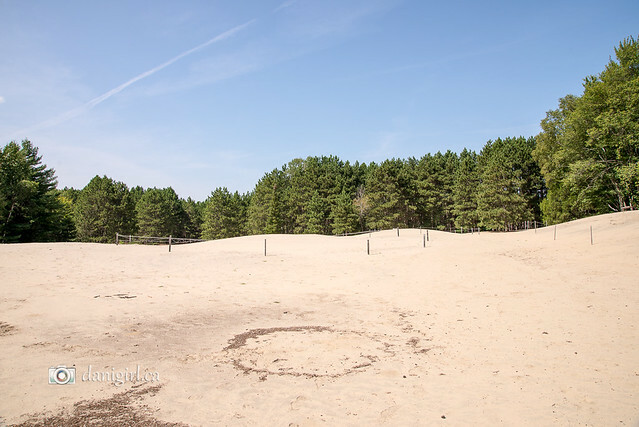 I have been hearing about the sand dune hidden in a pine forest in the Greenbelt for years. Finally, one day toward the end of summer, two of the three boys and I set off on a little adventure to check it out. 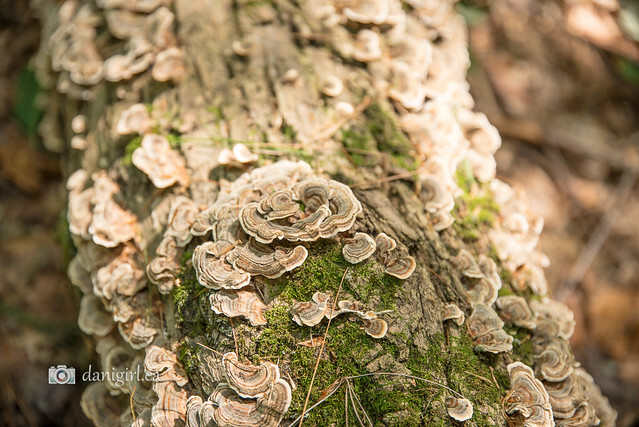 I’ve driven down Slack Road countless times, and had no clue about the unique and fascinating ecosystem hiding behind behind the pine trees, but it’s certainly accessible when you set out to look for it. Park on the street near the mailboxes on Pineland Ave near Vaan Drive and you’ll see the entrance to the dunes. It’s truly hidden in plain sight. Parts of the dunes are roped off, but there is plenty of room to walk around and explore. When the boys noticed some of the posts had been knocked down, they stopped to prop them back up again. We poked around the edges of the dunes, noting the towering pines in one area, and the oak and maples flourishing in another. 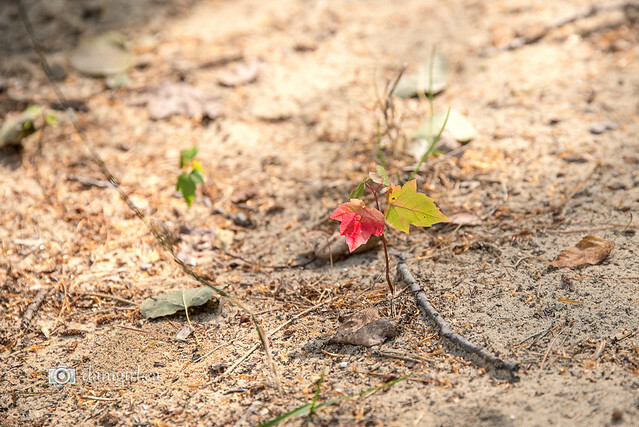 Be careful, we noticed a few places where poison ivy was also flourishing. 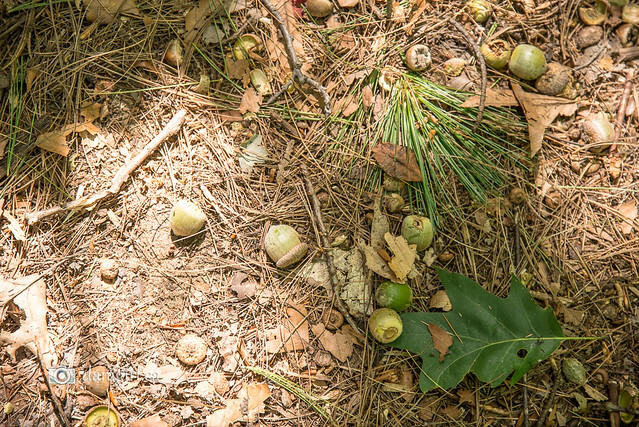 You can see how leaves and pine needles would fall and decompose, creating a mulch that would allow plants that wouldn’t ordinarily thrive in sand to take hold and encroach on the dunes. Not only is the dune an interesting geological artifact, but it’s home to plants and insects that don’t live anywhere else in the city. 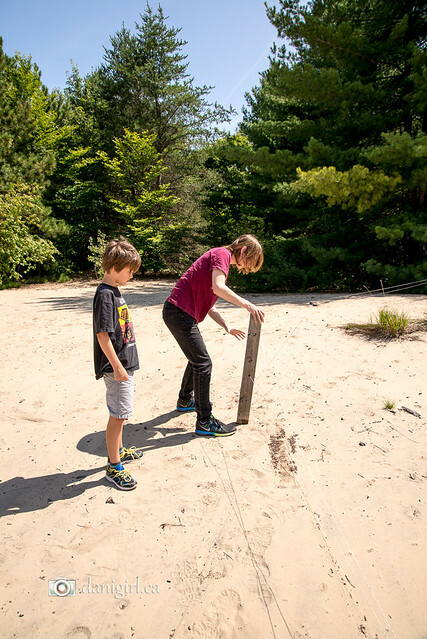 Conservationists are working to protect the dunes against the constant encroachment of native and invasive plant species. 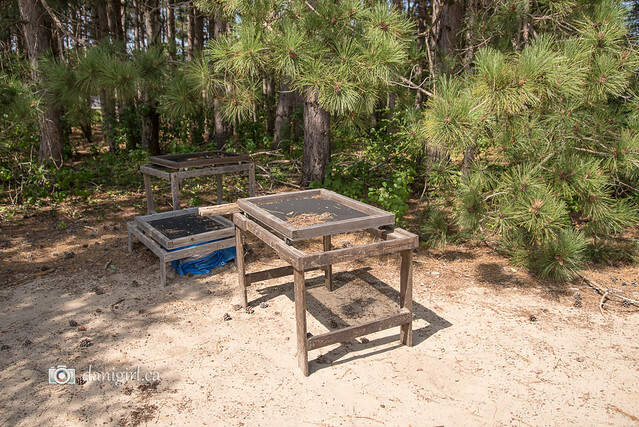 We originally thought these tables were part of an archaeological dig, but on reflection I’m betting they are used to filter the sand of other bio material. Like most National Capital Commission trails, you’ll find a few picnic tables and even a washroom on the site. 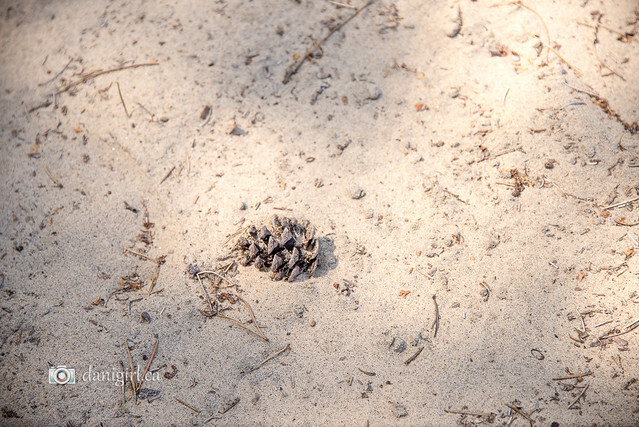 Exploring the dunes was a quick excursion – I’d be surprised if we were there more than an hour, even with a bit of poking around the walking paths through the surrounding forests. It made for an interesting set of conversations about the geological history of Ottawa, though, and about how people and nature leave their footprints on ecosystems. The boys were intrigued by the idea of a desert hiding in plain sight in a neighbourhood we drive past regularly. There’s more information about efforts to preserve the dunes and some of the unique plants and insects on the Biodiversity Conservancy website. It would be interesting to go back in the heart of winter to see the dunes in various seasons. Did you know about the secret sand dunes hiding in the Greenbelt? Have you visited? What did you think? I have been watching the progress of Manotick’s new Remembrance Park over the last few months. 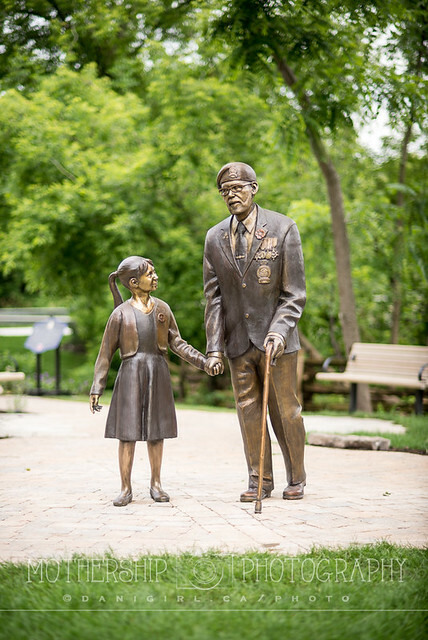 It’s a beautiful project in the town square beside Watson’s Mill, designed with six gardens to honour the branches of the Canadian military and those who support them. 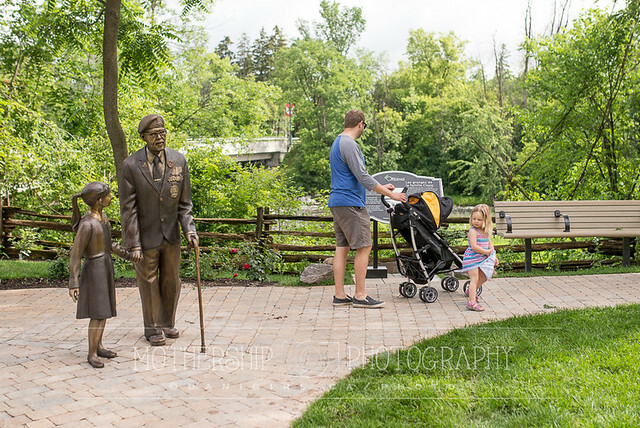 I had no idea there would be a life-sized bronze sculpture in the park until I was commissioned by the sculptor himself to come out and take a few photos of him and his art the day after it was unveiled. Nathan Scott, a Canadian sculptor based in British Columbia, is perhaps best known for his sculpture of Terry Fox at Mile 0. 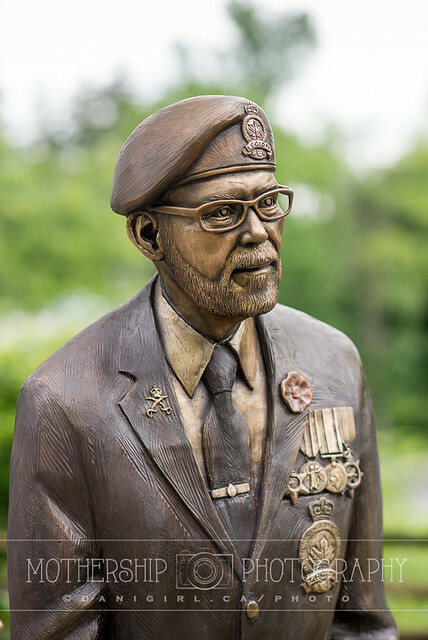 He has pieces installed across Canada, and now, we have one of our very own right here in Manotick. I can’t imagine a more beautiful, perfect addition to our community. You know what’s especially cool? 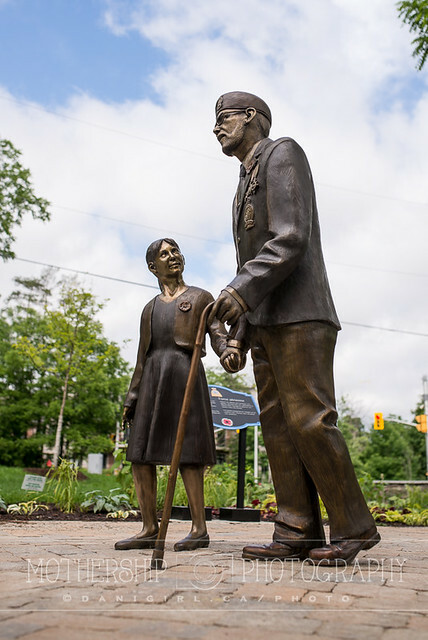 The figures are based on Nathan Scott’s own daughter and father. They are truly lovely, evocative and warm. The sculpture, placed in the middle of a square without a visible base (it’s below the bricks), invite you to come closer to admire the details in the bronze work, or to interact with the figures. Chatting with Nathan, an obvious family man with five (or was it six?) kids, made it easy to see where the warmth and love come from in the sculpture. I could have chatted with him about his inspiration and his processes all day! I’m so pleased to have this amazing new gathering place at the heart of Manotick, where it can be seen and touched and admired. 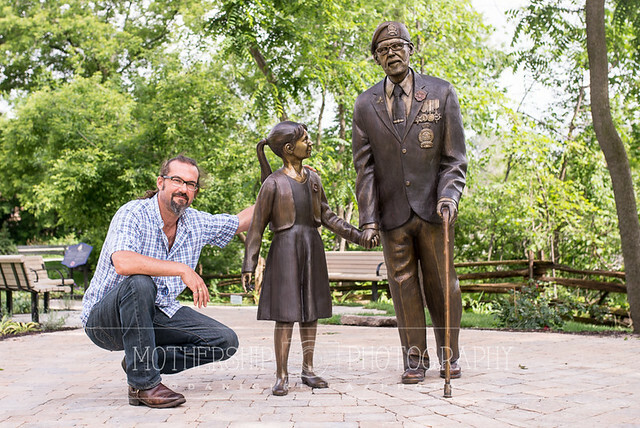 The sculpture is a loving tribute to both the aging veteran and all he stands for, and the power of family ties. I hope it provokes memories and conversations about the importance of remembering for generations to come.